Wait: the Dept. of Justice Is Supposed to Do Justice?? The courts are slapping Obama's US Attorneys with reprimands and sanctions, from all parts of the country. On Thursday, federal Judge Andrew Hanen in Brownsville, Texas filed an extraordinary order in the immigration case (Texas v. United States), in which his earlier injunction against DHS' implementation of President Obama's directions to delay deportation of millions of illegal aliens, as affirmed by the Fifth Circuit Court of Appeals, is now before the United States Supreme Court, awaiting its ruling after oral arguments. The order will require (gasp!) certain US Attorneys based in Washington to take annual courses in legal ethics for the next five years -- as a sanction for repeatedly lying to him in his courtroom. A lower-court judge had blithely accepted the IRS’s claim that the targeting had stopped, that applications for nonprofit status had been approved, and that the matter was therefore moot. The hearing also showed the degree to which the IRS has doubled down on its outrageous revisionist history, and its excuses. IRS lawyers again claimed that the whole targeting affair came down to bad “training” and bad “guidance.” They blew off a Government Accountability Office report that last year found the IRS still had procedures that would allow it to unfairly select organizations for examinations based on religious or political viewpoint. The lawyers’ argument: We wouldn’t do such a thing. Again. Trust us. More incredibly, the IRS team claimed that the fault for some of the scandal rests with the conservative groups, for not pushing back hard enough during the targeting. In response to complaints that the groups had been forced to hand over confidential information (information the IRS now refuses to destroy), one agency lawyer retorted: “They didn’t have to give the information to the IRS if they thought it was inappropriate, they could have said so.” Really. In the Texas case, Judge Hanen was far more severe, but arguably so was the unethical conduct of the US Attorneys from the Department's headquarters who appeared before him. You may read his order in its entirety here, and there is an excellent background summary of the whole matter here. What I find amazing is the alacrity with which the leftist news media have leapt to the defense of the "Justice" Department, and accused Judge Hanen of "violating the privacy" of illegal aliens. What did he do? He ordered the Government to file under seal a list of all the aliens to whom it had given deportation extensions while its attorneys were telling him in court that no such extensions were being granted, and that nothing was happening. Imagine that: their privacy is violated because their names and contact information will appear in a document that no one will be permitted to look at until the case is over, and then only if a plaintiff State makes its case to Judge Hanen that it needs access to the names of the immigrants in its borders who received illegal deferments in order to enforce its laws. In other words, the IRS's intrusive demands into the names and addresses of donors to non-profit organizations -- information which it refuses to destroy now that it has illegally collected it -- are as nothing compared to a judge's order to file under seal a list of those who benefited from the Government's lying. Go figure. Still other leftist sites don't see anything so wrong with what the attorneys did, since it was only to help out innocent "teenagers and young immigrants" who were "caught up in a bureaucratic screwup". Sure -- lying repeatedly to a federal judge is just a "bureaucratic screwup", and people who entered the country illegally can't be made to run the risk of exposure "to hostile State governments." Ethics, shmethics -- if you're a leftist, you do what you gotta do to get what you want. Even a leftist law professor wonders if Judge Hanen has "jurisdiction" over the DoJ lawyers who practice in states outside of his own -- in other words, a judge should be powerless to remedy the consequences of a fraud on his court that injured twenty-six States, and must focus on just the attorneys in his own district (who, Judge Hanen found, were among the few government attorneys who did not lie or misrepresent the facts to him, and whom he consequently exempted from the sanctions he ordered). Oh, yes -- and the Government itself? Turns out that it "strongly disagrees" with Judge Hanen's order. What did you expect? As we saw earlier with the Illinois Court of Appeals, its decision yesterday is a model of clear and succinct reasoning. Anyone reading it will be able to follow what happened in the case. Briefly, the Episcopal Church (USA) and its Potemkin shell of a plaintiff diocese sued the Anglican Diocese for everything it owned, based on their claims of "hierarchy" and the permanent, irrevocable trust supposedly embodied in the Dennis Canon; they lost their case in the Adams County Circuit Court in Quincy, Illinois, as reported in this earlier post. They appealed to the Fourth District in Peoria, which affirmed Judge Ortbal's thorough and thoughtful decision, as described in this post. Then they asked the Illinois Supreme Court for leave to appeal the case to that tribunal. In November 2014, it refused, so the decision by the Court of Appeals became final. On the day before the appellate court was due to issue its mandate returning the case to Adams County, Mr. Beers and his local team wrote National City Bank again, and threatened it with a new lawsuit if it should try to disperse any of the funds held in trust for the Quincy parishes. The bank responded that all of the funds were combined in a single account, and that it had no means of telling which funds were in trust from those which were not, as that was purely an internal Diocese bookkeeping matter. Faced with the threat, however, it announced it was again freezing all the funds. Never mind that Judge Ortbal had ruled in his (now final) decision that all of the funds in the bank belonged to the Anglican Diocese, and that neither ECUSA nor its propped-up and fast-fading "Episcopal Diocese of Quincy" had any interest in or claim to the funds. This was a brand-new claim, don't you see? The earlier case had not even considered whether any of the moneys had in fact been held in trust, rather than owned outright, by the Diocese. The attorneys for the Anglican Diocese responded to these moves by asking the Circuit Court of Adams County for an order enforcing its judgment, unfreezing the funds, and restraining the plaintiffs from pursuing their persecutions in Peoria. Circuit Judge Mark Drummond (Judge Ortbal had retired in the interim) agreed, and specifically found that Judge Ortbal's prior decision about the ownership of the funds was now final, and could not be "collaterally attacked" in any new lawsuit. He issued the injunction, ordered the bank to release all of the funds from its freeze, and sanctioned the plaintiffs by ordering them to pay all of the attorneys' fees incurred by the Diocese of Quincy in order to enforce the (now final) judgment. "THE COURT: Where does it say that [in] Judge Ortbal's order? Where does it say that? THE COURT: Wouldn't it have to say that explicitly? [COUNSEL]: No, Your Honor, because the subject matter of [that] case was diocesan property. THE COURT: And wouldn't—if there's a mistake in Judge Ortbal's order, wouldn't you have to bring a motion to correct that? [COUNSEL]: If there was a mistake, Your Honor. THE COURT: Well, aren't you saying there was a mistake? It's not in there. [COUNSEL]: I'm not saying that there was a mistake, Your Honor. What was adjudicated was diocesan—my client's interest in diocesan property." "The court's considered the pleadings and the arguments. I am not confused. This is a very simple issue. I find [the Church's] position in this case to be so lacking in merit that I am assessing sanctions in this case." ¶ 33 Put simply, the trial court in the original Adams County action found the Church had no interest in any of the funds in the National City account. The Church did not file a motion to reconsider or a motion to clarify to argue the court's judgment should apply to just 82% of the funds. On appeal, we affirmed the trial court's judgment. Thereafter, the supreme court denied the Church's petition for leave to appeal. As such, the issue has been settled as a matter of law, and any relitigation is barred by the law-of-the case doctrine. ¶ 34 If the Church wished to advance its current theory of the case, it should have argued in the alternative before the trial court and on appeal. Instead, the Church chose to wait until after the trial court rendered its final judgment to file a complaint in a different county (located in a different appellate court district) advancing an alternative theory of recovery. Under the circumstances of this case, it was improper for the Church to do so. Accordingly, the trial court's judgment granting the Diocese's motion to enforce is affirmed. Alas for the Anglican Diocese and its members, this decision, satisfying as it is, still does not end all of the matters pending against them. Before they lost the first appeal, but after they had lost in the trial court, the Episcopal team of litigators filed two more actions in Illinois courts: one against an incorporated parish in Moline, seeking the funds and property it held in its own name, and the other the aforementioned suit in Peoria, seeking not just the 18% of the bank funds held in trust for parishes, but also the real property of those parishes. These cases were stayed pending the appeal from the injunction and order granted by the Adams County Circuit Court. It is nonetheless deplorable that the new Presiding Bishop of ECUSA sees fit to allow his litigators to continue to waste the Church's trust funds and pledge income on litigation for purely punitive purposes. One has to wonder, when it comes to going after realigning dioceses and parishes, just who is in charge of ECUSA after all these years. The irony is that a person who acts as his own attorney (or lets his attorney make all the decisions, which comes to the same thing) has, as those of us in the profession happily admit, "a fool for a client." I write as a longtime member of the Diocese of Chicago, a lawyer in my secular vocation, an award-winning writer of devotional essays, and as a Christian who believes in the word of God, first to advise you of an adverse ruling in the Illinois Appellate Court in long-pursued litigation against the former Diocese of Quincy and second, to request your intermediation to have this Diocese and others cease and desist from further litigation over the physical property and intangible assets of those parishes or dioceses which have chosen to leave the national body. On May 13, the Illinois Appellate Court sanctioned the Diocese of Chicago for bringing a second lawsuit after it had already lost the first one at the trial court. I do not know how much this Diocese will have to pay for the departing parishes' and diocese's legal fees, but it can be expected to be in the hundreds of thousands of dollars. That is money that comes from my pocket and that of other devoted Christians, all to pursue a legal position that is, frankly, untenable. As explained at length in the Appellate Court's opinions, the national church has been wrong on the law (insofar as it has contended that the Episcopal Church is "hierarchical"), wrong on the facts (insofar as it has contended that the Diocese has a protected property interest in the buildings and other assets), and the act of pounding on the table and arguing someone else's case has grown thin. Because of this gross mis-use of funds, I will ask my parish, Church of the Ascension in Chicago, to reduce its annual giving to the Diocese. Regardless of the applicability of St. Paul's admonitions against Christians' use of secular courts, the scorched earth policies of your immediate predecessor should be rejected. While I believe that you do not have the authority to tell your brother and sister bishops how to run the affairs within their dioceses, you do have the power of the purse as to the use of national church funds in this foolish enterprise. I bid you to use it. Several generations of law students and their teachers grew up with federal courts dominated by conservatives. Not surprisingly, they found themselves wandering in the wilderness, looking for any sign of hope. The result: Defensive-crouch constitutionalism, with every liberal position asserted nervously, its proponents looking over their shoulders for retaliation by conservatives (in its elevated forms, fear of a backlash against aggressively liberal positions). 1 A jurisprudence of “wrong the day it was decided.” Liberals should be compiling lists of cases to be overruled at the first opportunity on the ground that they were wrong the day they were decided. My own list is Bakke (for rejecting all the rationales for affirmative action that really matter), Buckley v. Valeo (for ruling out the possibility that legislatures could develop reasonable campaign finance rules promoting small-r republicanism), Casey (for the “undue burden” test), and Shelby County. (I thought about including Washington v. Davis, but my third agenda item should be enough to deal with it.) Others will have their own candidates. What matters is that overruling key cases also means that a rather large body of doctrine will have to be built from the ground up. Thinking about what that doctrine should look like is important – more important than trying to maneuver to liberal goals through the narrow paths the bad precedents seem to leave open. 2 The culture wars are over; they lost, we won. Remember, they were the ones who characterized constitutional disputes as culture wars (see Justice Scalia in Romer v. Evans, and the Wikipedia entry for culture wars, which describes conservative activists, not liberals, using the term.) And they had opportunities to reach a cease fire, but rejected them in favor of a scorched earth policy. The earth that was scorched, though, was their own. (No conservatives demonstrated any interest in trading off recognition of LGBT rights for “religious liberty” protections. Only now that they’ve lost the battle over LGBT rights, have they made those protections central – seeing them, I suppose, as a new front in the culture wars. But, again, they’ve already lost the war.). For liberals, the question now is how to deal with the losers in the culture wars. That’s mostly a question of tactics. My own judgment is that taking a hard line (“You lost, live with it”) is better than trying to accommodate the losers, who – remember – defended, and are defending, positions that liberals regard as having no normative pull at all. Trying to be nice to the losers didn’t work well after the Civil War, nor after Brown. (And taking a hard line seemed to work reasonably well in Germany and Japan after 1945.) I should note that LGBT activists in particular seem to have settled on the hard-line approach, while some liberal academics defend more accommodating approaches. When specific battles in the culture wars were being fought, it might have made sense to try to be accommodating after a local victory, because other related fights were going on, and a hard line might have stiffened the opposition in those fights. But the war’s over, and we won. You're welcome to what your victory will bring, I'm sure ("let thy will, not My will, be done..."). If this is what they teach at law school, can the seminaries be far behind? Of course all bets are off if Donald Trump becomes President. But if he does, constitutional doctrine is going to be the least of our worries. Have at him in the comments -- but please keep things on the Christian side of civil. 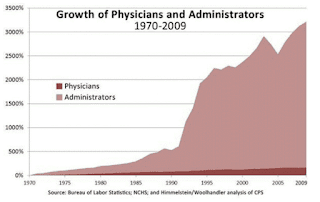 Note in passing that the growth in the number of doctors is far below the corresponding growth in US population over the same period (another figure that has expanded enormously, due to the government's lax policing of our borders). The correlation is obvious: the more that government regulates health care, the less that smart people want to become doctors who are subject to its dictates -- regardless of how many people might need them. Consequently, no individual knows for certain what he or she may earn after so many years of study -- indeed, the "minimum" payment for services keeps going down as total costs increase. And so, why work so hard for an ever-decreasing return, especially when the return will not be based on skill or invested effort? The sheer complexity of keeping a lid on government-regulated compensation for all that healthcare (which compensation is euphemistically referred to as "insurance", through sponsored, mandatory "plans" whose compensatory details are likewise regulated to the nth degree) is the cause of the obscene bulge in administrators, which the graph depicts so vividly. Folks, like everything else in life, you get the care that you pay for. What the government pays for is bloated bureaucracy and the red tape that bureaucracy generates. Its claims to want to make health care more "affordable" are mere smoke and mirrors: it cannot achieve them, because it is government. The essence of government is the appropriation and spending, with no accountability, of other people's money. When money is spent with no accountability for results, the money goes to those who don't want to account for it. And they are the last people to whom you want to entrust your health, your well-being, or your future.